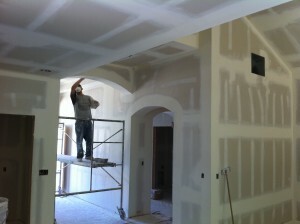 Do you need a drywall contractor in West Linn? Our trained staff can help you with any type of project. Our crews can handle small repairs, like a hole in the wall, all the way up to a large commercial project. We have successfully completed large apartment complexes and housing subdivisions. No project is too large or too small. Do you have a remodeling project? Or a home with fire or water damage? We work with the best remodel and restoration companies in West Linn. They trust us to repair the drywall in their projects. Are you interested in smooth finish? Our highly skilled tapers have completed many level 4 and level 5 smooth projects. Smooth finish is becoming more popular in West Linn, and if you need the best finishers, please call us today for an estimate. I contacted Indigo a few weeks ago and needed some drywall repair in multiple areas of my home. They came out and gave me a bid, which was within my budget. Their repair crews were a few weeks out, and I did not mind waiting for them. Alvaro was the team leader, and sent out his best patch guy to fix the areas. I was extremely pleased with the outcome! The repair is not visible, they were able to match the texture. My ceilings look amazing!